Apple today has made a notable change to the App Store experience for users in Israel. 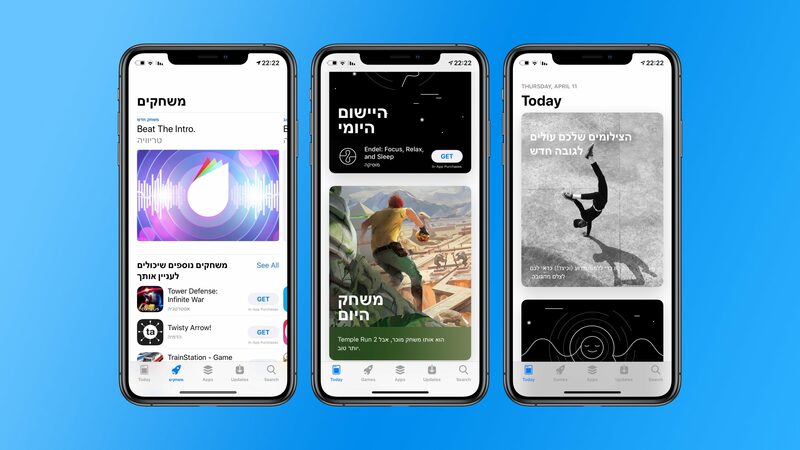 Apple today has started the process of localizing the App Store to Hebrew, including featured stories in the Today tab and more. With today’s change, featured stories in the App Store’s Today tab are now localized to Hebrew. This means the text itself is in Hebrew, while it’s also laid out right-to-left. Category names also now appear in Hebrew alongside their dedicated icons. Despite the improvements, however, the App Store experience still isn’t perfect for users who speak Hebrew. The overall App Store app language is still in English and therefore not aligned to the right – as is custom for right-to-left languages such as Hebrew. What this means is that the tabs along the bottom of the App Store are still primarily in English, as are app titles and various header text throughout the app. Prior to this change, all App Store content for users who had their iOS system language set to Hebrew would be presented in English. Thus, despite today’s update not being perfect, it’s a notable improvement. It’s also likely that Apple is in the process of preparing full localization for users who speak Hebrew, with this just being the beginning step.